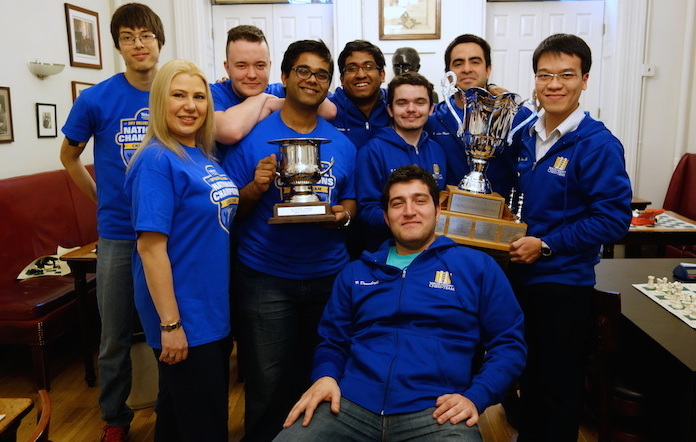 (ST. LOUIS) - Webster University’s chess team won its fifth consecutive national championship this weekend during the 2017 President’s Cup Collegiate Chess tournament in New York City. Webster University is the only university in the history of the President’s Cup (also known as the Final Four Tournament) to win five consecutive championships. This win was also the seventh consecutive for Grand Master and Coach Susan Polgar and her SPICE program. Along with Susan Polgar and Paul Truong, assistant coaches Grand Master Manuel Leon Hoyos and Grand Master Ashwin Jayaram led the team to victory. "This was an incredibly hard victory, and the students gave everything they had," said Coach Polgar. "The competition on Saturday lasted nearly 13 hours, underscoring the importance of both physical and mental toughness." He became a GM at age 15, and is ranked #1 in Vietnam since 2008, a World Blitz Champion, 2-time Aeroflot Champion, multiple-time Chess Olympian, multiple-time World Cup participant, 2-time SPICE Cup Champion, and 3-time College Chess Final Four Champion. His hobbies include sports and reading. Grand Master Ray Robson, from the U.S.
Ray is a senior, studying International Studies with an emphasis on Asia. He is the former youngest GM in US history, and is an Olympiad Gold Medalist, multiple-time World Cup participant, 2-time SPICE Cup Champion, and 4-time College Chess Final Four Champion. His hobbies include tennis, music and reading. Alex is an MBA graduate student. He became a GM at age 16, and is a Russian champion in multiple age groups, World Cup participant, and College Chess Final Four Champion. His hobbies include hockey and poker. Vasif is a senior, with a Major in Economics and a Minor in Spanish. He became a GM at age 18, and is a World Youth and European Youth Champion, World Cup participant, and 2-time College Chess Final Four Champion. His hobbies include Crossfit, soccer, ping pong, basketball, reading, and languages. Illia is a junior and studying Computer Science. He became a GM at age 14, and is a Moscow Open Champion, 3-time World Open Champion, US Open Champion, National Open Champion, SPICE Cup Champion, and 2-time College Chess Final Four Champion. His hobbies include ping pong and movies. Priyadharshan is a graduate student in Management & Leadership. He won 11 medals for India in Asian, World and Commonwealth Championships, and is a Chicago Open Champion, Mid-American Open Champion, and the MVP of 2012 US Chess League. His hobbies include movies, Indian music, Indian politics, and reading autobiographies. Webster University’s SPICE program, founded by former Women's World Champion Susan Polgar in 2012, currently has a total of 23 diverse and talented students. Four are African American; other countries represented on the team are Russia, Ukraine, Vietnam, India, Azerbaijan, Indonesia, Colombia, Israel, and Mexico.